It is not often that an Auxiliary police officer receives an invitation to visit another country's police service by its chief of police. Our March Officer of the Month, Auxiliary Constable Tatiana Kobets, of 14 Division, had the rare honour of being invited by the Chief of the National Police of Ukraine, Sergii Knyazev, to drop by his police headquarters for a visit on her next trip to the Ukraine. 14 Division CRU Staff Sergeant Tam Bui explained that 14 Division hosted a delegation of Ukraine police commanders in January, who had travelled to Canada with the RCMP and other federal partners from the UN mission in Ukraine. Kobets delivered a presentation on the TPS Auxiliary program in their home language, which turned out to be one of the highlights of their trip. "She allowed us to showcase the diversity that we promote here in the TPS," said Bui. Promoting the TPS Auxiliary program to our international partners is just one of many details that Tanya, as she likes to be known, does on a regular basis. An Auxiliary member for four years, Tanya logged a total of 234 hours in 2018, with 200 hours dedicated to community-based policing. For her hard work and dedication in engaging with community members at 14 Division, Tanya was honoured as Auxiliary Officer of the Month for March. 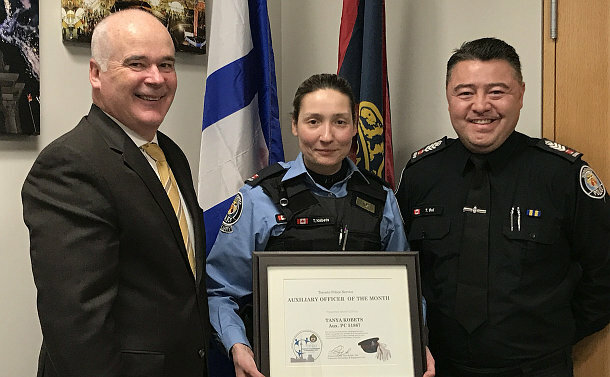 She was presented with a framed certificate and a gift card on March 18, 2019 in the presence of 14 Division Superintendent Neil Corrigan, Staff Sergeant Tam Bui and Constable Andrew Rosbrook, one of the Auxiliary Coordinators responsible for approximately 350 Auxiliary officers in the Toronto Police Service. “These monthly awards are just one of the ways CPEU is trying to encourage and motivate our Auxiliary officers," Community Partnerships & Engagement Unit Supt. Dave Rydzik said. Uniformed auxiliary officers volunteer approximately 70,000 hours annually to assist the Service’s community engagement initiatives, crime prevention programs, special events, parades, searches for missing persons and emergency call outs. In addition, 14 Division has a number of directed patrols relating to traffic and community complaints and Tanya is always the first one to sign up. "Communication is a key factor to working with the public. Seeing Auxiliary officers like Tanya on patrol makes them feel safe and confident that their police division and their officers care and want to make a difference within their community," said Auxiliary Staff Sergeant Tim Maiola. Tanya is at her best out on patrol in the neighbourhood doing details such as talking to people about road safety and the importance of being vigilant and respectful. "I love the diversity of 14 Division, from the Portuguese Day parade to the Khalsa Day celebration, the St. Francis of Assisi parade and Taste of Little Italy, there's no lack of details and I enjoy them all," Kobets said. "You never know when your language skills can come in handy. In the Portuguese parade I came across a woman in distress who happened to speak only Ukrainian and she was having trouble trying to cross the street. It was wonderful to be able to help out." As much as she wants to become a police officer, Tanya is not in a hurry as she really enjoys what she does as an Auxiliary officer, being able to engage, not only with the community, but with her fellow "brothers and sisters" of the Toronto Police Service. "At 14 Division, we are always needed and we are treated by the parent service like one of their own," Kobets said. For someone who joined the Auxiliary to "get her feet" Tanya has definitely found her niche in policing. "Her level of commitment is exceptional and she is in the program for all the right reasons," Maiola said. "We wish Tanya all the best as she pursues her goal of becoming a police officer."